Once we determine the correct cause of your ailments, it is important to help maintain proper joint motion. As a patient who’s a dentist once told us, all of our therapy stretches and exercises are meant to do one thing: help support proper joint hygiene. Since the primary focus is on consistent mobility, we encourage a proactive approach towards healing. That is why Dr. Dominic and Dr. Matt created specific “Home Protocols” for each of his patients to do both in the office and at home. Adding a therapeutic exercise regime to your health program helps to speed your recovery by stabilizing your “Core Muscles” and improving your body’s “biomechanics”. Your muscle’s are there for support, so why not use them to the best of your ability. 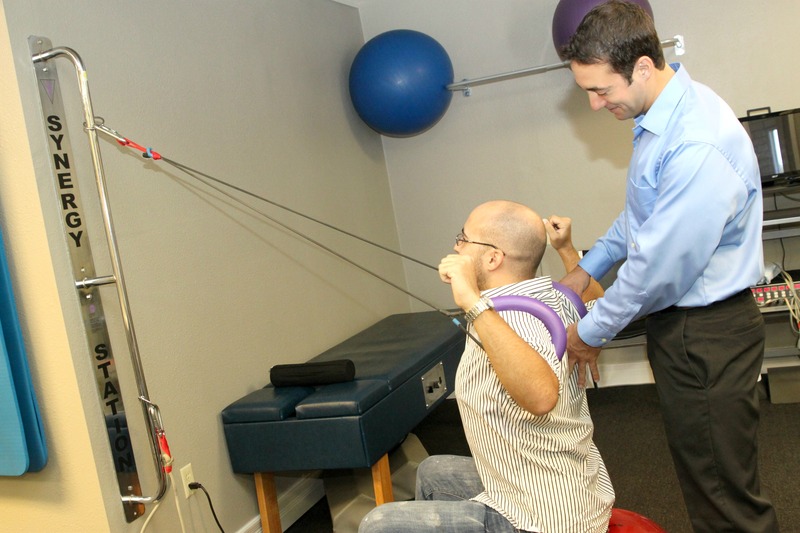 As an Athletic Trainer, Dr. Dominic utilizes sports training and Kinesio Taping with a majority of his patients. You probably first saw Kinesio-Tape on Kerri Walsh’s shoulder during the Olympics in 2008 or on Lance Armstrong’s Knees in the 2009 Tour de France. This sports specific tape was first designed by a Japanese Chiropractor called Dr. Kenso Kase in 1997. Dr. Dominic started using it with his athletes in 2002 and then with “real people” in 2006. Since then he has utilized its specific ability to aid the healing process by encouraging normal body motion.